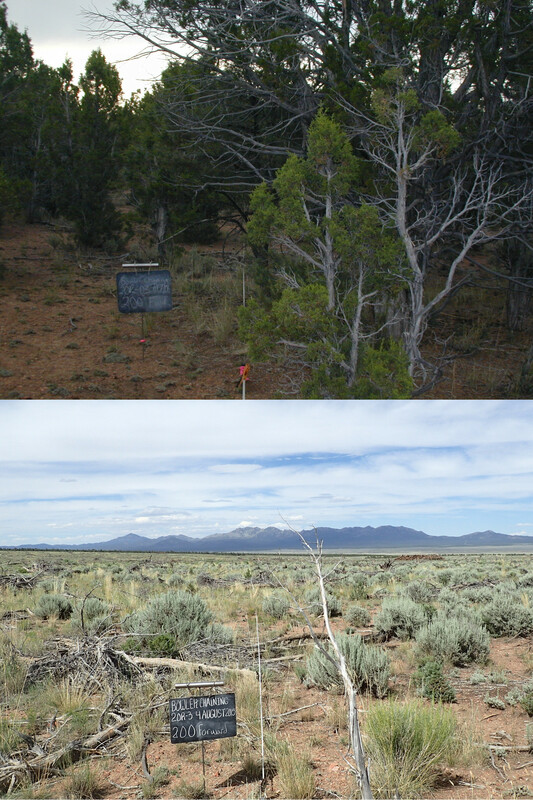 ST. GEORGE — A Utah-based conservation group and a state organization are going head-to-head with competing advertisements over the practice of chaining, a method removing pinyon and juniper forests to make way for sagebrush and grass habitat. Vegetation removal by chaining is achieved by dragging a large anchor chain between two crawler tractors over forested landscapes, which are subsequently reseeded to make way for the growth of vegetation appropriate for livestock and wildlife foraging. According to SUWA, the removal projects disrupt fragile ecosystems, destroy cultural sites and interrupt the visual aesthetic of an area. Watch Watershed Restoration Initiative’s ad below. Used since the 1950s by federal and state agencies on public lands, chaining and similar vegetation-removal practices are used on older stands of pinyon and juniper where the trees have almost completely driven out grasses, flowering plants and shrubs. SUWA, however, in its news release, stated that any benefits beyond providing better forage for sheep and cattle lack scientific support. The primary push of SUWA’s campaign is to prevent chaining in the newly reduced borders of the Grand Staircase-Escalante National Monument where the BLM is proposing chaining as one of the methods to remove vegetation on over 13,000 acres. “Chaining is completely incompatible with protecting the fragile ecological, paleontological and archaeological resources in Grand Staircase,” SUWA’s release stated. According to the WRI, no “green tree” chaining projects in the monument are under consideration for the upcoming fiscal year, and no new management plan has been devised that would allow for the type of chaining depicted in SUWA’s commercial. An environmental group vs a government agency. Do we pick a side by trying to determine which is the least absurd? … in a new cashmere or recycled hemp sweater. Once again the tree huggers have shown their enthusiasm outdistances their knowledge. Huggies, there will always be an abundance of junipers and pinyons but their presence prevents foraging for animals. Apparently the value of animals is greater than the trees. I agree. Once again the stupidity of Utahns comes shining through. Your comment is typical of someone with a “drill baby, drill” mentality. Ignorant to your graves. with m&m that is so very true. Granted, the pinyon/juniper (PJ) removal procedure does increase browse and grazing. This is not just for livestock but wildlife as well. Sagebrush habitat is critical for sage grouse reproduction and the PJ forest is almost completely void of their breeding grounds. Compared to the habitat after the sometimes “invasive” pinyon and Juniper, the forest is of reduced habitat value. It is good for cover for larger animals, but islands could be preserved to fulfil that benefit. It is good for pinyon nut production, but again could be maintained by islands of forest. It is good for post and firewood production. I resent those folks calling themselves conservationists, they are more accurately called preservationists-which has its place in certain circumstances. If you are interested in a professional take on the issue, please copy and paste the following URL published by the Society of American Foresters.